Ed Boggs, Airframe Team Leader, discussing careers in aviation at Lakeview High School. Recently Fred Wilkins Lead Airframe Mechanic, Ed Boggs, Airframe Team Leader and I attended Lakeview High School’s Parent-Teacher conferences in Battle Creek, Michigan. Alongside colleges, banks, military recruiters and school clubs, Duncan Aviation had a booth. I’m sure you’re wondering, “What is an aviation company is doing at a Parent-Teacher conference?” Well, consider this. How many times has a message from school actually made it home to you, the parent? From my own personal experience with my sons, whenever the communication actually did make it home it was cryptic, vague and sometimes had no resemblance of the intended message. To bridge the communication gap between the school and home, Lakeview High School started to invite local businesses and organizations to Parent-Teacher conferences to be available should parents have questions about a potential involvement with their student. Our goal in attending this event was to make students, parents, teachers and administrators aware of careers in aviation and specifically what we do at Duncan Aviation. We also wanted to share information about the future of aviation and the projected high demand for technicians. Many parents and teachers asked us about the closing of the control tower at the Battle Creek airport and how it would affect our business. We assured them that aircraft will continue to come to Duncan Aviation for maintenance needs. The closing of the control tower will now require pilots to communicate with other aircraft through radio headsets; and that there are many uncontrolled airports around the country that pilots frequent. During the conference, a family was browsing nearby when the father suggested his son talk with us about future career opportunities. Not interested the son said, “No, I want to go into Engineering.” Having heard this, Fred Wilkins grabbed a Duncan Engineer Career Sheet to the young man and said, “Here you go.” The dad smiled, the son said “Oh” and mom winked at Fred. After a conversation about what Duncan Aviation is all about, they took more of our materials and continued on. The dad later returned to talk further about aviation. In a nutshell that was how nearly all our conversations that evening went, as people by and large are unaware of what a career in aviation has to offer. Because of our presence at a high school Parent-Teacher conference, there are now about 25 more people who are aware. Duncan Aviation is committed to encouraging future generations to get interested in careers in aviation. Every year, many Duncan Aviation representatives attend and talk to thousands of High School students, parents and teachers, educating them about the wide range of career opportunities available. 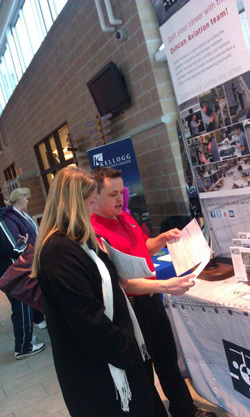 The following are recent career recruiting events attended by representatives from Duncan Aviation attended. May 7 – Aviation Workforce Development Think Tank - Industry Leaders meeting in Minneapolis to brainstorm ideas on how to address a looming technician shortage in our industry. Nowhere are aviation jobs more sought after than at Duncan Aviation. With a retention rate unheard of in the industry, a job at Duncan can come to mean way more than just a paycheck. For many, it's acquiring a level of expertise that is sought after and respected by OEMs and suppliers alike. Click here to view current job openings at all Duncan Aviation locations. Roger Ausbury is the Sales Technical Specialist located at Duncan Aviation's Battle Creek, Michigan, facility. Besides providing airframe sales support, he specializes in helping people not take themselves so seriously, dream interpretation and uniting Minnesota Vikings fans everywhere. His aviation career began in 2002.